Who would’ve ever thought that Mario and Rabbids would have a crossover game, I personally didn’t. I have to also admit that I didn’t have any interest in it either but after playing this amazing game, I was so wrong to doubt it. The Nintendo Switch library is already solid with titles like Zelda: Breath Of The Wild, Mario Kart 8 Deluxe and Splatoon 2 but that library just got that much better with the inclusion of Mario + Rabbids Kingdom Battle. Don’t let the family friendly image fool you, Mario + Rabbids Kingdom Battle can be brutal in another way which is the difficulty. Battles against the pesky Rabbids will take skill and patience as these Rabbids can be smart and tricky that you will really need to think of your next moves as one round of wrong moves could lead to pretty much the end of the battle with these crafty things called Rabbids. I guess that’s why before each battle there’s an option to activate an easy mode that’s much more forgiving and meant for those who want a casual gaming experience. For those who want a tough thinking battle then don’t you dare ever touch the button for easy mode. Battles make up most of the game, I mean of course it does.. That’s why it’s got the word “Battle” in the title. These battles are very reminiscent of another turn based shooter game called XCOM which I’m sure many have heard of before. It borrows the same gameplay elements like having areas that act as shield, but can be destroyed by the enemy team and having each area you can move to marked as squares but have a restricted area you can’t go past until closer. 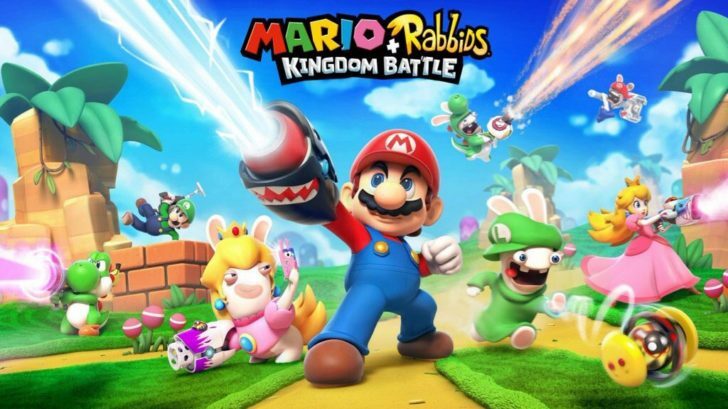 If you are a fan of a game like XCOM, and want a family friendly take on it, then you should be more than interested to give a game like Mario + Rabbids Kingdom Battle a try. Battles are thankfully split up between cutscenes and adventuring around the current world you’re in to get to the next part. It’s not that I don’t like the battles, I think they are really good and fun to play but as you can imagine, you don’t want to keep doing the same thing over and over again. So that’s why I really liked how the game was perfectly split between battles, cutscenes and adventuring through the world you were in. Not much happens during the times you are away from battles, but it’s the perfect time to appreciate and soak in the brilliantly crafted worlds that this game produces. The levels are beautifully designed, and stay extremely faithful to the art style that so many love from the Mario games. The levels are colorful, bright and vibrant. Each level looks and feels different thanks to the amazing design that I just can’t praise enough. If you’ve played a recent 3D Mario game you will understand and appreciate how great these levels look with that Mario art style. I can safely say that it is by far the best looking Nintendo Switch game to date. I also wanted to talk about how it runs on the Nintendo Switch, as that seems to be a question that many have when major AAA games come to the console/handheld hybrid. From my many, many hours of gameplay which was mostly as a handheld, I never really had any problems at all, and I can say that the game ran smoothly and looked great as a portable game. When docked, Mario + Rabbids Kingdom Battle is visually at its best, and as you already know from the review, it looks amazing. Mario + Rabbids Kingdom Battle is another hit for the Nintendo Switch, and is a must buy for many different fans. Fans of Mario, fans of Rabbids, fans of turn based shooters should all have their eyes on this wacky but brilliant collaboration. The gameplay is solid yet tricky, but an optional easy mode makes it fun for everyone. The visuals are what you can expect from anything with Mario in the title, stunning. Each area looks incredible and unique which is something some may not appreciate due to the somewhat linear exploration. Nintendo Switch owners go out and buy this game today!